Perfect for groceries, a beach bag or as a large purse, this canvas tote make a beautiful, stylish statement. 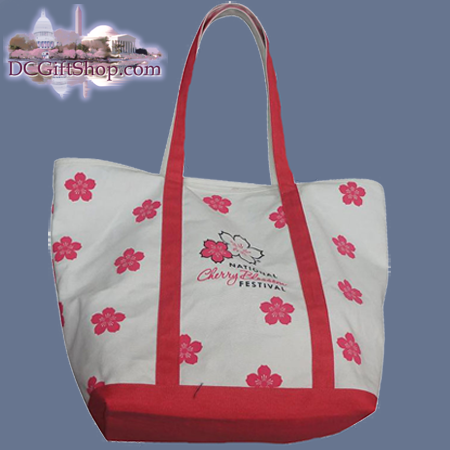 Constructed of ultra-durable heavy-cotton canvas, this bag has a white shell festooned with blooming cherry blossoms and features the National Cherry Blossom Festival log on the front. The outside of the tote is reinforced on the outside bottom with red canvas which carries up into the tote handles for increased durability. This tote is stylish, eco-friendly, and can carry anything and for a long time at that.